I’ve eaten at Rod’s a few times now and it is consistently impressive and worthwhile! I was there with a group of 8 for a bachelorette party dinner this past weekend and we had a great time. The service was good, the timing was pretty good ( we waited a bit longer than ideal but the food more than made up for it) I started with the Rodney Strong Russian River Pinot Noir ( a favorite) and two blue point Oysters ( TERRIFIC) I am so picky about oysters. They are either Very good or Dreadful, there really is no in between. These were terrific. Next time I visit I will certainly be ordering more of these! They were flavorful without being too much, they were fresh and absolutely perfect. 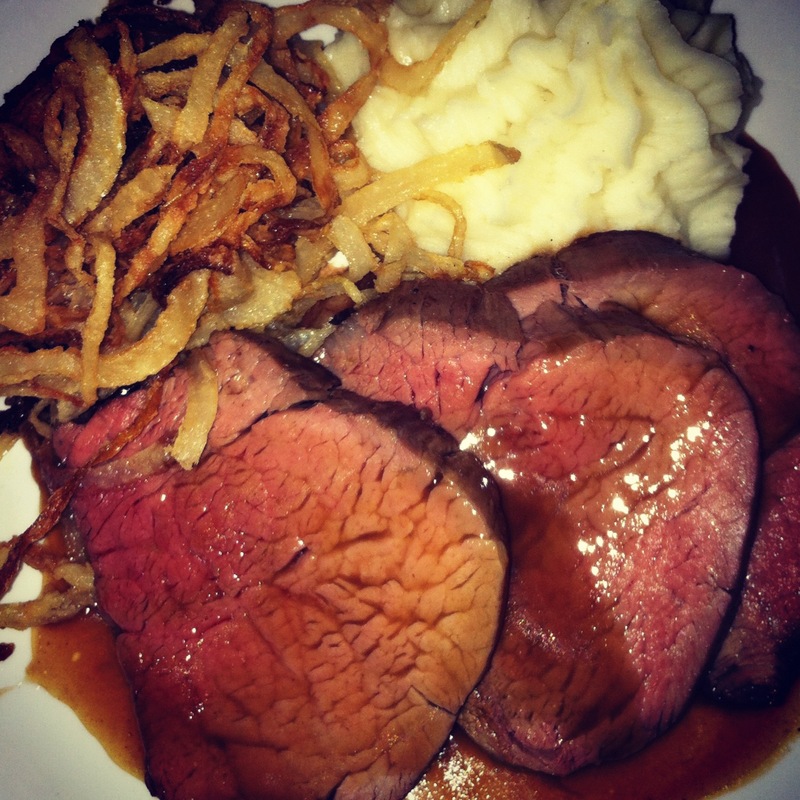 I then had the 9oz sliced tenderloin with pureed potatoes and sweet onion strings. Fantastic! I order my meat medium rare and will not hesitate to send it back if it’s medium or over. This was cooked absolutely too perfection and specification. The potatoes were very good, the onion strings were fantastic and the demi glace was absolutely delicious. Each bite was terrific, there wasn’t an ounce of fat anywhere and I cleared my plate. There were 3 orders of the Filet & Lobster Tail with Maryland Blue Crab that came out and looked fabulous. I believe the comments from the three girls sitting next to me with the Surf & Turf said, this might be the best meal I’ve ever had! The roasted chicken that came out looked awesome. Portions are NOT skimpy here so you will never have to worry about leaving hungry. The Roasted Vegetable Entree looked great as well. The eggplant looked tender not mushy or overdone, the mushrooms looked great as well. The salmon looked unbelievable. It was a great cut of fish, not overcooked, not undercooked, the Fennel Cream was a great addition and everything was plated beautifully. We were absolutely too full to even order dessert but I’ve had it before and it’s spot on! One of my first time at Rod’s was with an ex of mine for his birthday. We ordered the lobster and I had the 9 oz filet au poivre with a side of creamed spinach ( amazing!) We ended up having to leave in the middle of the meal before anything had come out and we happened to be staying in the hotel, so they were more than accommodating and brought everything to our room, along with a birthday cake for him and two glasses of champagne on the house. It was absolutely above and beyond the call of duty and a great gesture for them. I will forever be a fan of Rod’s and look forward to many more excellent meals!